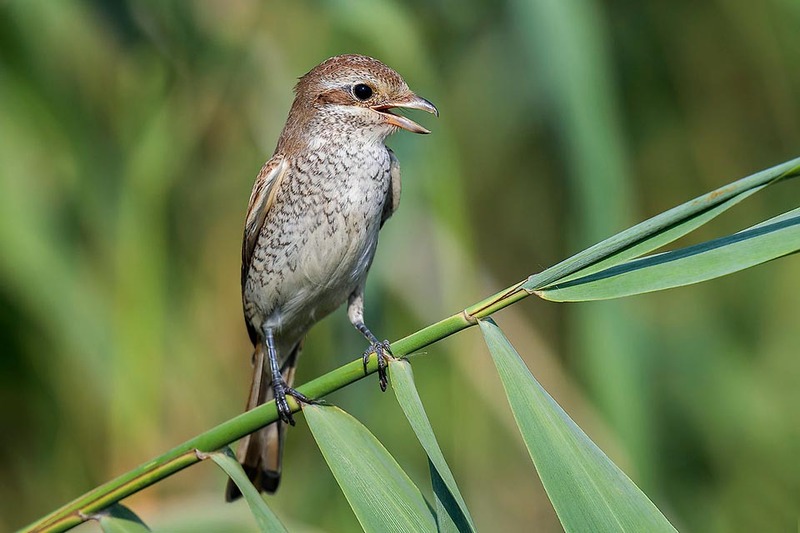 The Red-backed shrike or Common shrike (Lanius collurio Linnaeus, 1758) belongs to the order of the Passeriformes and to the family of the Laniidae and is the smallest member of this family among the species present in the Eurasian Palearctic. This winged creature drags from centuries a quite ugly but well-deserved reputation, seen that its usual conduct leads it to commit with absolute normality misdeeds of remarkable ruthlessness. In nature do exist many animals that have fierce behaviours, some are predators and hunt other similars for eating them, others adopt ways that for us, human beings, appear “inhumane” and that we call “ravening wolves”, others still having a repulsive and disgusting behaviour, like the necrophagous animals but none seems to behave with so much wickedness and inopportunity like the shrikes. On the other hand this blemish is regularly resumed in all languages, so much to prove how much true is the feeling that this bird has given to all those who have known it. The populations of every latitude have called it butcher, knacker, choker, murderer but even the scientific name Linnaeus had chosen for it leaves no doubt. Lanius from the eponymous Latin term that means butcher and collurio from the Greek “kollurion”, name already mentioned by Aristotle to indicate a small bird having particular aggressive attitudes and probably identified in a shrike. Actually, in Germany they have called it also Neuntöter (nine dead) to indicate that before eating it kills nine victims and even Rotrückenwürger (destroying angel) for analogous reasons! But what will it do of so bad this small bird to get such a bad reputation? 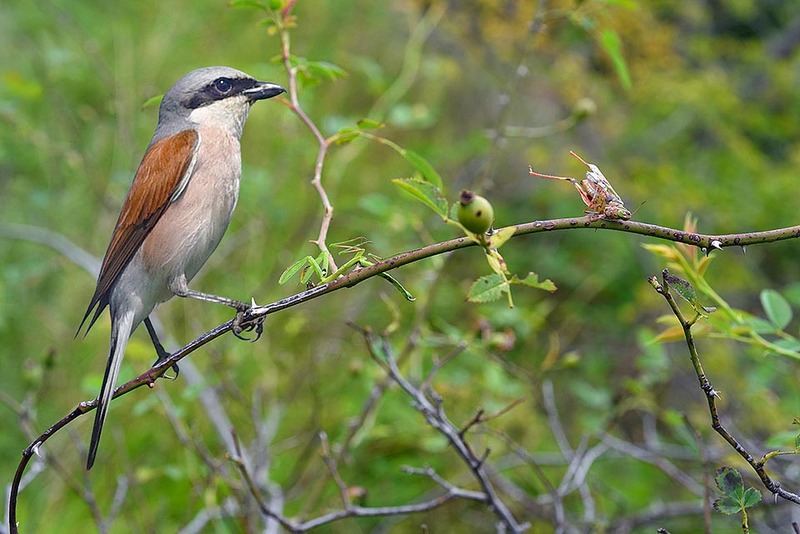 The red-backed shrike spends the whole day hunting its preferred preys that vary from small animals to big insects and does so even without having the necessity and even when already sated. No member of the animal world kills more than necessary, usually the seizure of a prey is limited the present feeding needs and may vary only due to the number of mouths to nourish. Actually, at times happens that in the case the prey is bigger than the necessity, the predator hides or keeps the watch on the leftovers, ready to consume them to the bones before hunting another prey. 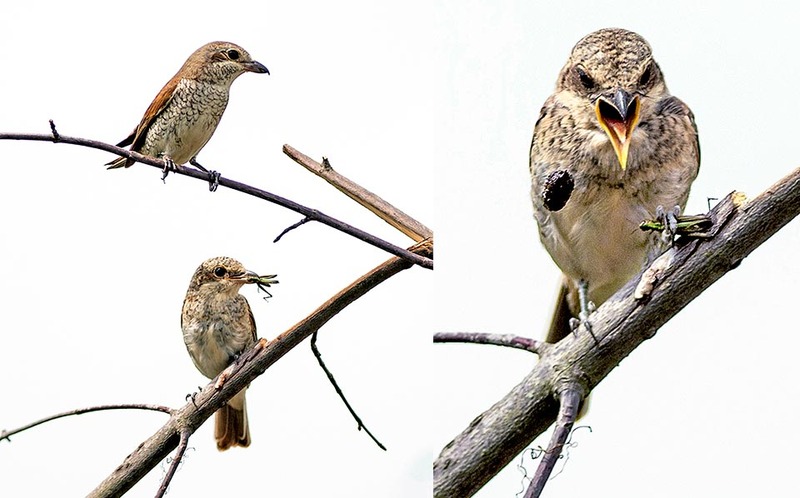 The shrike instead proves a great deal of fun in catching preys more than necessary and in conserving them in a sort of pantry that then often it fails to use. Nothing strange, so far, if it were not for the uselessness of seizing preys more than needed but the striking fact is that these victims are brutally impaled on spines or barbed wire fences and there abandoned to the public derision. So, we find uselessly skewered small frogs, coleopterans, small mice and many other insects. In Europe it is called Red-backed Shrike in English, Neuntöter in German, Alcaudón Dorsirrojo in Spanish, Pie-grièche écorcheur in French, Picanço de dorso ruivo in Portuguese and Averla piccola or Averla minore in Italian. Other dialectal Italian names are redestoea, gherla, scavassua, giarla, garla, muscarate, gerlato, laniere, smerlo scorticatore, gàstriga, gagèt, sgazetù, farlotto, ghierla, gazzina, avèlia e vèrla. The common Italian name of averla does not have a sure etymology and might come from some dialectal form wrongly transcribed or wrongly pronounced, even if some think that the original form of the name “averula” may come from the Latin “ave querula” = mournful bird, due to the awkward song it usually emits, Latin then become macaronic and replaces by vulgar languages in averla. Clearer is the etymon of the English name shrike, traditionally used in the ornithological world to indicate all laniids of the planet that has instead onomatopoeic derivations. The verb “to shriek” rightly means in English to scream and partially imitates the unpleasant sound emitted by this small bird when it informs of its presence and comes, or originates, the names that the north European populations have given to this grouping of small birds. Skrikja, shrieker, skrika in the Scandinavian peninsula and Schrik in German. 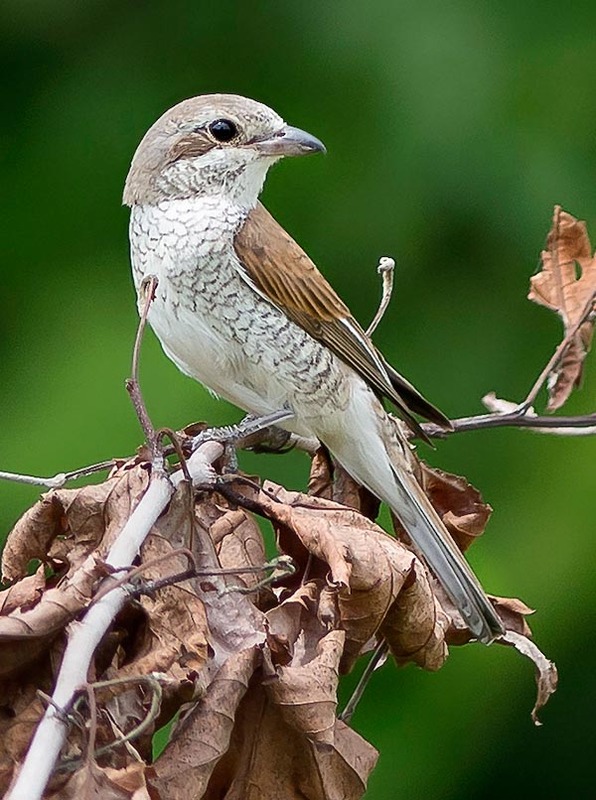 The red-backed shrike is a long range migratory bird: it spends the summer in the Palearctic whilst in winter it shelters in tropical areas, passing the Equator. It occupies diffusely the whole European continent in the eastern part to reach the central-Asian plains and southward limiting to Anatolia and occasionally in Middle East. In Europe it is absent in the northern part of the Scandinavian peninsula, in England and in Ireland where it has become very rare, in the northern part of France, in Benelux and in most of the most of the Iberian peninsula. In Italy, it occupies the whole peninsula with rare presences in Puglia and Sicily. 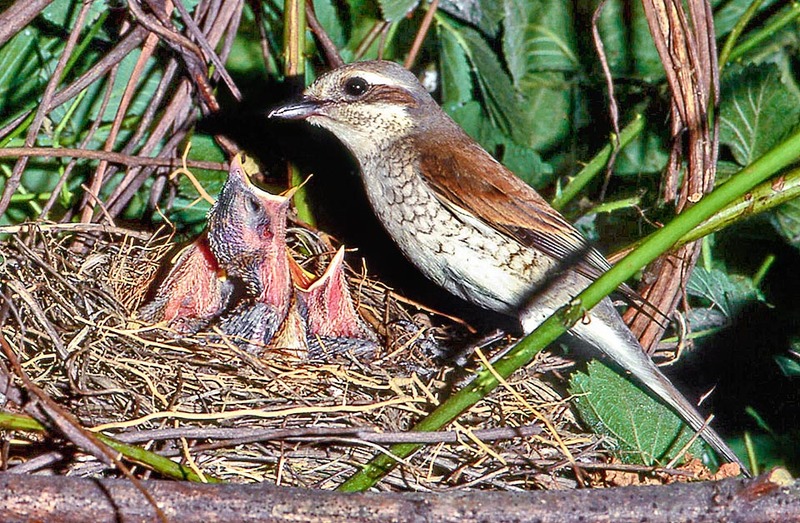 The red-backed shrike was, a few decades ago, one of the most common birds in the central-northern plains of Europe. In summer in the Po Valley was, along with the House sparrow (Passer domesticus) and the Eurasian tree sparrow (Passer montanus) a habitual recurrence in our countries and represented with its unpleasant but well known call, one of the sounds archetype of the good season, together with the cicadas and the singing crickets. The country was disseminated with banks with pollarded plane-trees, mulberry trees and vineyards rows, small fruit orchards, plenty of brambles and a vastity of stable meadows subject to periodical and with traditional means irrigation, a natural environment where the insects swarmed exceedingly. Then suddenly, the agriculture changed method and type of cultivation, transforming the environments initially natural, in monocultured deserts, with huge extensions of corn and soy and with the indiscriminate use of pesticides and herbicides, with consequences easy to imagine. Its presence has become now very discreet and occasional so much to talk of it as a terrible debacle for this species. In some areas where this industrialization has not been very successful, the species has maintained good levels of presence but overall all the populations present in the primitive territories underwent, by the end of last century, a terrible stop. All populations winter in Africa with a greater presence in the eastern side but occupying diffusely all southern part. The variety of the habitat frequented by the red-backed shrike and the remarkable adaptability of this bird to the various habitats of the Palearctic, have rendered difficult the full understanding of the reasons that have made possible this sudden disappearance. It could be thought that with the decrease of habitat in some areas, it originated balancing developments in other zones or even an addiction to the new environmental needs. It is therefore not yet total understood the real reason of the dramatic decrease of this species. The frequented habitat is an open area, at the limit of treed zones, rows of trees in a cultivated country, hills with low and spiny bushes, steppes, uncultivated meadows at altitudes going from the sea level up to about 2000 m.
The hilly zones up to 1000 m are the eppicentre of its habitat even if in the northern zones it is placed at the limits of the taiga woods, in the open spaces close to the coniferous forests. It does not frequent woods and area highly treed if not accidentally during the migration. In the wintering territories it is found in the African grassy savannahs along the Rift Valley, with sparse groves of acacia, around the large African lakes and on the arid slopes of the hilly and mountainous systems. The red-backed shrike is a charmful small bird with bright colours in the male and more attenuated and discoloured in the female. The male exhibits an ash-coloured head getting down up to the shoulders to change then in an intense and bright hazelnut coloured mantle, marked by black remiges. Also the rump is ash grey and accompanies a very white tail, with a jet-black terminal band. The central flight feathers are black and when flying they are very showy and display the drawing of a big inverted T.
The tail is an element of the body very evidenced by the red-backed shrike. When resting, it moves it continuously, raising and lowering it as if it used it for keeping in balance and when flying it’s a determinant part for distinguishing this bird from other similar species. As previously said, on the front it has the typical black mask that starting from the beak covers the whole ocular area like a big eyebrow. The chest is totally cream white with pink shades on the sides, at times very accentuated. Very robust beak, strong and massive, conical and hooked, almost like a raptor. The female has a livery completely of matte rusty colour, whilst the cream chest is highly spotted by small blackish marks, similar, on a reduced scale, to those of the Sparrow hawk (Accipiter nisus). Also, has the typical bandit mask even if less accentuated than the male. The young are similar to the female but with slightly more marked shades and more accentuated grizzle. The red-backed shrike has a flight fast and straight but in the mean time also agitated and a little messy, with nervous movements and rapid wingbeats, often asynchronous. Its song is characteristic and corresponds to a little dry grubbing and continuously repeated. Its clumsy “ghè ghè ghè” emitted typically from the top of a tree or of a bush, can be easily heard even from very far away. Conversely, the song love is a faint and soft melody emitted shortly, “tight-lipped”, as if it was uniquely reserved to its partner. It has a total length of 18 cm, weight of 30/35 g and 28 cm wingspan. Some subspecies have been classified among which Lanius collurio collurio present in most Europe and Asia, the Lanius collurio kobylini of Asia Minor and Caucasus, the Lanius collurio pallidifrons of the extreme Asian territory and the Lanius collurio juxtus not accepted by all. The male anticipates of a few days the arrival of the females in the reproduction sites and, found the suitable location, occupies it immediately waiting for the partner to come. 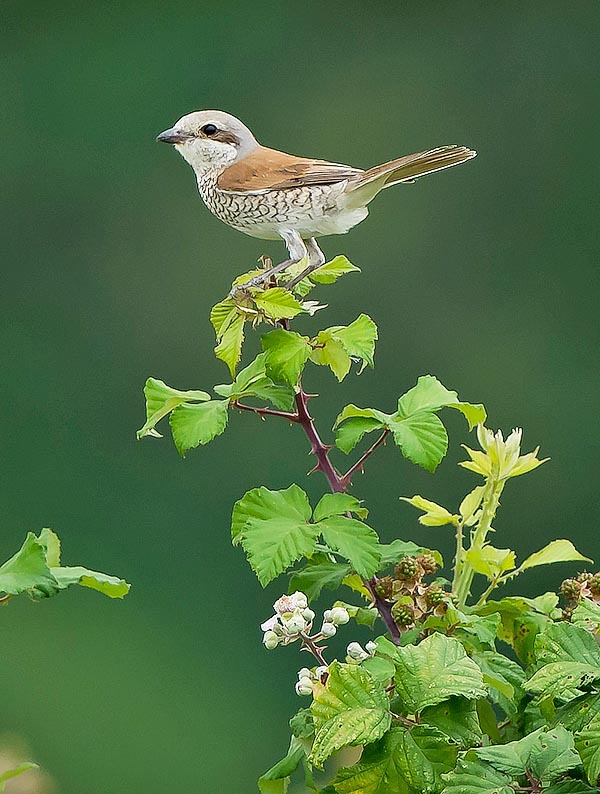 The red-backed shrike arrives quite late in the summer quarters and belongs to the last seasonal migratory wave that includes some typical long range migratory birds. It is contextual to the Common quail (Coturnix coturnix) and the Golden oriole (Oriolus oriolus), the European turtle dove (Streptopelia turtur) and the Nightjar (Caprimulgus europaeus), birds that remain with us a few months, just the time to grow up one single hatching. 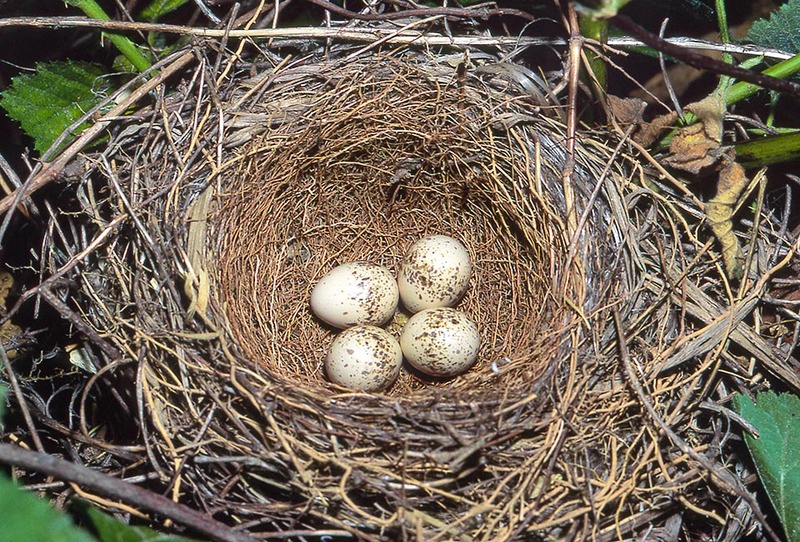 The nest is built almost totally by the male, at low height from the ground, immersed in a mass of brambles. In that time it was placed on the vineyard rows or on the pollarded trees also well exposed but when placed between the brambles or spiny shrubs it is difficult to find it and even the access is quite difficult. A platform is constructed with small stems over which is put some herbaceous material increasingly finer such as small roots and dried grasses to form a well drawn and deep cup. Are laid 4 to 6 cream white eggs, spotted of reddish small dots in the amplest part to form a well defined crown. 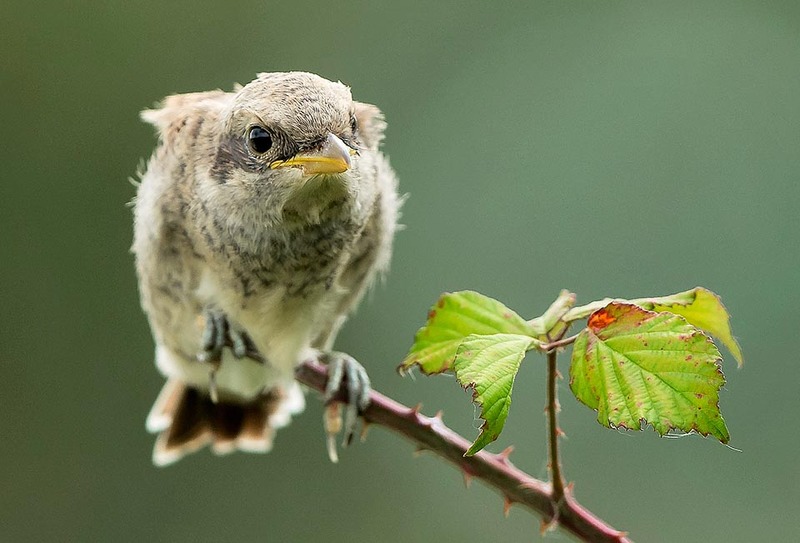 The brooding done by the female lasts 14 days but the young are very impatient and often jump out from the nest precociously scattering all around. The parents in any case care them for various weeks more before they get independent. The red-back shrike is a carnivore and nourishes indifferently of small rodents, small frogs, lizards but essentially of big insects, in particular coleopterans, orthopterians and hymenopterans, dismembering them as soon as seized, when the prey is small otherwise it prefers to impale them when too many or of out of reach measures. A joke for the comic books readers and referred to this small bird. 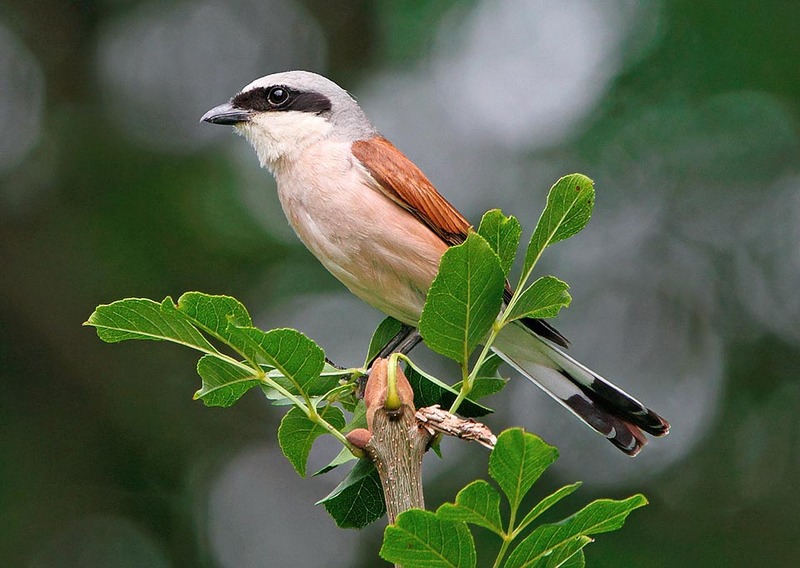 If you well observe the livery of the red-backed shrike, you will note that it has always a showy black mask on the face, of the type of that worn by the Beagle Boys of the series of Donald Duck cartoons. An atavistic indication of its bad habits or perhaps nature has deliberately masked it in order to hide, to the surrounding world, the face of a wicked bandit? It would be nice to think that Walt Disney did merely copy this bird to create one of his characters of Duckburg.